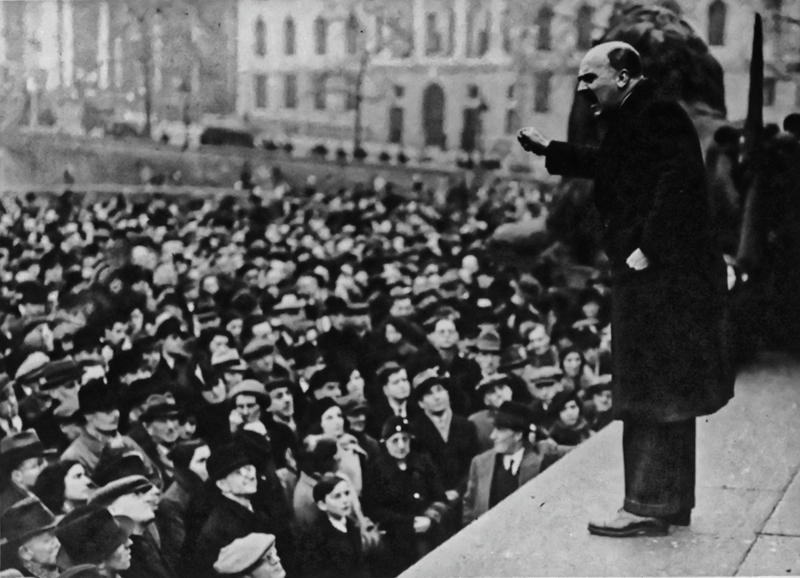 Haldane agitating for the Communist Party. 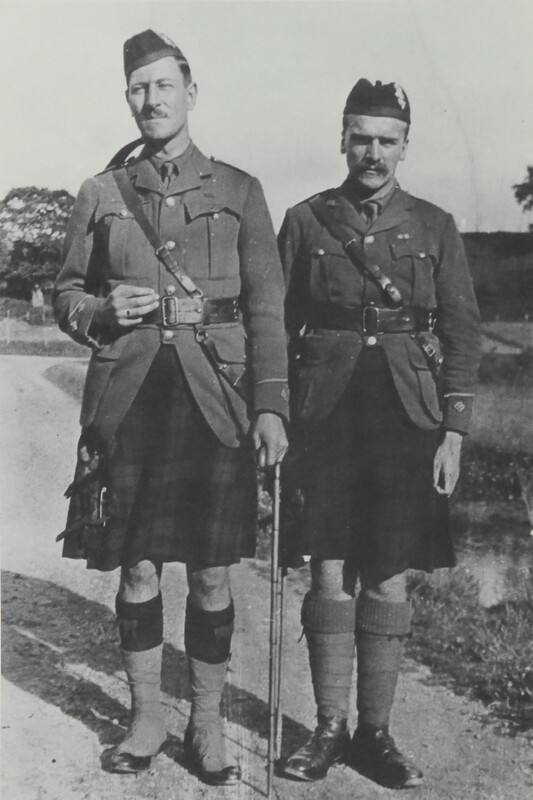 Haldane (right) in the Black Watch circa 1915. "It was not merely uneconomic to take steel for thousands of miles from Ukraine to Siberia, when it could be made on the spot, or to take raw cotton from Tashkent to Moscow, and send cotton goods back again. Stalin saw that the formerly subject peoples had a right to industrial development." JBS Haldane, Science Advances (1944), p. 206. 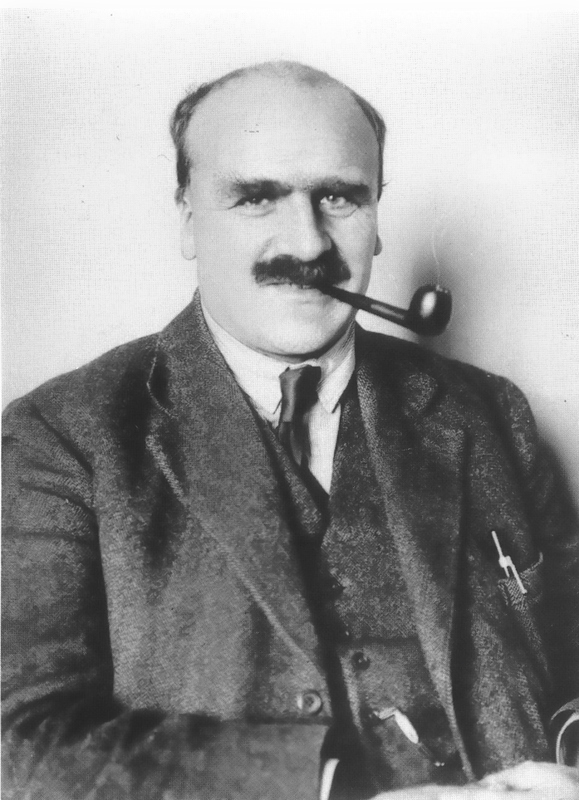 In his day Professor JBS Haldane was as well-known a scientist as one could hope to be. Magazines paid handsomely for his articles explaining science to the general public. Collected in books, these continued to sell for years. When he voiced his classically-educated opinions, the newspapers listened, and the BBC transmitted them. Reckless physiological self-experimentation, learned from his father, created useful drama. 'Prof' had the sort of presence as a general science popularizer and skeptic that Richard Dawkins and Stephen Jay Gould came to command half a century later. But Haldane had a far broader scientific reach, and more panache. Technically, he was a mathematical population geneticist and evolutionary theorist, one of the founders of the New Synthesis which anchored Darwin to Mendel through statistical wizardry (impressive to those in the know, but an unpromising basis for broader fame). Along the way, he also took up communism. A detailed consideration of Haldane's politics and his involvement in Soviet espionage, based on previously ignored sources, including MI5 files and the Haldane Archive at UCL. Published here in (mobile-friendly) HTML and PDF formats. I was born at Oxford, England, in 1892. My father was Prof. J. S. Haldane, the physiologist. I was educated at Eton and New College, Oxford. but However I learned much of my science by apprenticeship, assisting my father from the age of eight onwards, and my university degree is in for classics, not science. I was in a British infantry battalion from 1914 to 1919, and was twice wounded. In 1919 I began scientific research in 1910, and became a Fellow of New College, Oxford, in 1919. I was at Cambridge from 1922-1932 as Reader in Biochemistry, and have been a professor in London University since 1933. I was visiting professor in the University of Berkeley, Cal., in 1932. In the same year I was elected a Fellow of the Royal Society of London. My scientific work has been varied. In the field of human physiology I am best known for my work on the physiolog effects of taking large amounts of ammonium chloride and other salts. This has had some application in treating lead and radium poisoning. In the field of genetics I was the first to discover linkage in mammals, to map a human chromosome, and (with Penrose) to measure the mutation rate of a human gene. I have also made some minor discoveries in mathematics. Whilst I may have been a credit to my universities, I am have not been a trial in other ways. I was dismissed from Cambridge University in 1926 in connexion with a divorce case, but regained my post on appeal to a higher tribunal, which found that the university authorities had decided to dismiss me without hearing my case. At present I have refused to evacuate University College, London, and, with two assistants am its sole academic occupant. I am carrying on research there under difficulties. Besides strictly scientific books I have written a number of popular works including a children's book of children's stories. I consider that a scientist, if he can do so, should help to render science intelligible to ordinary people, and have done my best to popularize it. Till 1933 I tried to keep out of politics, but the support given by the British Government to Hitler and Mussolini forced me to enter the political field. In 1936-1938 I spent three months in Republican Spain, first as an adviser on gas protection, and then as an observer of air raid precautions. I have been was in the front line during fighting, and in several air raids behind the line. Since then I have tried, with complete lack of success, to induce the British Government to adopt air raid protection measures which had proved their efficacy in Spain. Mr. Chamberlain's policy, and the recent developments in physics and biology, combined to convince me of the truth of the Marxist philosophy. Though I am a member of no political party, I have of late years supported the communist party on a number of issues. At present I am engaged on research in genetics, & research intended to save the lives of members of the British armed forces, and in on writing and public speaking designed to prevent the spreading of the present war, and if possible to secure bring about peace. I am a fairly competent public speaker. It will be seen that my life has been a full one. I have been married for ten 14 years, measure 73 inches, weigh 245 pounds, and enjoy swimming and mountain walking. I am bald and blue-eyed, a moderate drinker and a heavy smoker. I can read 12 11 languages and make public speeches in three, but am unmusical. Daedalus or Science and the Future. London: Kegan Paul, 1923; New York: Dutton, 1924. PDF Facsimile and HTML transcription. Callinicus: a Defence of Chemical Warfare. New York: Dutton, 1925. Possible Worlds and Other Essays. London: Chatto and Windus, 1927. Science and Ethics. London: Watts, 1928. The Causes of Evolution. London: Longmans, 1932. Biology and Everyday Life. London, 1933. The Inequality of Man and Other Essays. London: Chatto and Windus, 1932 [Penguin Reprint, 1938]. My Friend Mr. Leakey. London: Chatto and Windus, 1937 [Penguin Reprint, 1938]. Science and Everyday Life. London: Lawrence and Wishart, 1939. A Banned Broadcast London: Chatto and Windus, 1946. Science Advances London: Allen and Unwin, 1947. Everything has a History London: Allen and Unwin, 1951. The Biochemistry of Genetics London: Allen and Unwin, 1954. Unity and Diversity of Life: Sardar Patel Lectures Ministry of Information, Indian Government, 1958. Science and Life: Essays of a Rationalist. London: Pemberton, 1968. Selected Genetics Papers. New York: Garland, 1990.